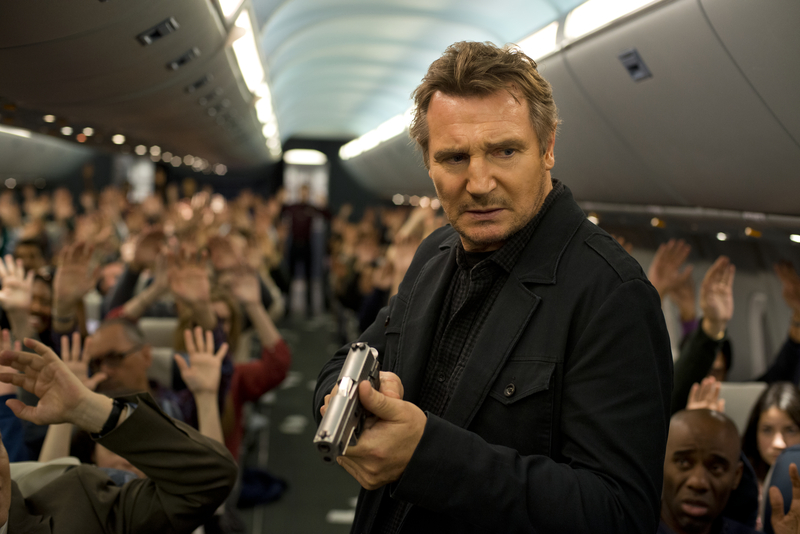 As in their previous collaboration, 2011’s Unknown, Liam Neeson and director Jaume Collet-Serra effectively set up intrigue, mystery, and tremendous tension in the early going of Non-Stop. But the film’s methodical pace and emphasis on suspense rather than action will probably prove unsatisfying to viewers hoping for a Taken-like experience. As in their previous collaboration, 2011’s Unknown, Liam Neeson and director Jaume Collet-Serra effectively set up intrigue, mystery, and tremendous tension in the early going of Non-Stop. But the film’s methodical pace and emphasis on suspense rather than action will probably prove unsatisfying to viewers hoping for a Taken-like experience, and the payoff for all that built-up tension fails to deliver a satisfying conclusion. 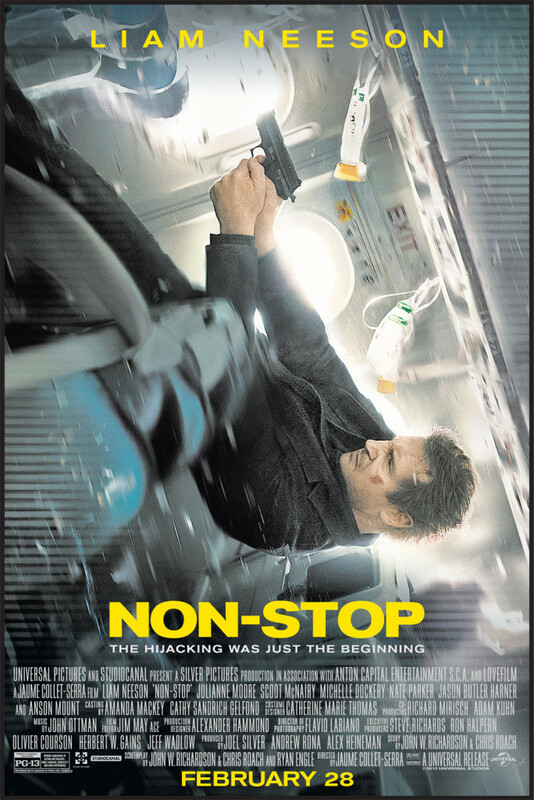 Bill Marks (Neeson), a disheveled, stressed out everyman who also happens to be a U.S. Air Marshal, boards a transatlantic flight from New York to London, expecting it to be as routine a flight as all the others. Of course, it turns out to be anything but (wouldn’t be much of a movie if it did); hours into the flight, with the plane halfway over the Atlantic, Marks receives a text message on a network supposedly only for use by the TSA and the Federal Air Marshal Service. The mysterious messenger threatens that a passenger on the plane will die every 20 minutes until the airline transfers $150 million dollars into a specified numbered account. Taking the threat seriously, Marks lets the pilots and crew in on the situation and enlists them and a fellow passenger, Jen (Julianne Moore), to help him find whoever on the plane is sending the messages. But things get a whole lot more complicated once people start dying, as clues arise that point the finger of suspicion for the deaths and the whole situation squarely at our hero. With the clock ticking, the body count rising, and the passengers and crew growing more and more distrustful of Marks and his strong-arm tactics as he tries to solve the mystery, Marks finds himself alone and uncertain of anything at all, except that what’s happening may have nothing at all to do with money or extortion. Someone’s trying to send a message, and they want to use an Air Marshal with a spotty past and a 767 full of potential air travel fatalities to do it. First of all, this is a film that’s not served very well by its marketing. In addition to over-hyping the action when the film really is a mystery/thriller, the trailers and publicity info divulge information about Marks that the filmmakers don’t choose to reveal right away. To be specific, the film is cut in such a way that the fact that Marks is an air marshal is one of the LAST things we learn about him in the opening act, and it’s a clever reveal. However, it seems the ad people wanted to use that bit of info to provide a clear hook to get you into the theater, and so an interesting storytelling choice goes entirely to waste. That said, the rest of Non-Stop, in the hands of a lesser director, would be a far more derivative and unengaging film than it turns out to be. As it stands, it’s a film that will succeed in holding your interest and keeping you in suspense almost to the very end if you’re willing to be patient. Collet-Serra doesn’t rush the proceedings along; he takes the time to visually introduce you to Marks and plethora of character flaws going into things, as well as his relationship with the crew and early interactions with passengers who will be important later on. He also utilizes the confined spaces of the aircraft — the different passenger cabins, the lavatories, the galley and the cockpit — to add claustrophobic tension to which audiences familiar with air travel can relate to the atmosphere. Finally, the choice to show the text messages going back and forth between Marks and his adversary as on-screen graphics, rather than repeated shots of a cell phone’s tiny display, keeps things interesting visually. It’s a borrowed technique, no doubt — fans of the BBC’s “Sherlock” know it well — but it works, for the most part. As for the cast, they deliver just what you might expect them to, which lifts the material considerably, but they’re also not given enough to do. Neeson can play the gruff, rough-around-the-edges hero in his sleep at this point, but before he started making these Taken-type action roles his bread and butter he was a dramatic actor, and his skills serve him well when he’s asked to wordlessly convey just how much of a mess Marks is going into the crisis. Unfortunately, he’s the only character even remotely developed here. Moore’s role plays to her strengths — charming, plucky, intense — but at this point audiences know she’s capable of much more and might go in expecting more, which they won’t get. Downton Abbey‘s Michelle Dockery gets to stow Lady Mary Crawley’s haughty aristocratic airs for a while here to play Nancy, one of the lead flight attendants, but its a wasted choice, as she’s not called upon to do much more than look anxious or scared. All that would be forgivable in a mid-budget thriller, perhaps, if the payoff for all the tension built, all the red herrings chased and plot turns taken, was worthwhile. But when the action finally does come in the film’s final minutes and things start exploding, not only is it too little, too late, but it also veers off into the absurd, with believability getting sucked right out of the cabin along with the luggage and the coach-class seats. (Watch for when Marks uses an emergency air mask to fend off an assailant armed with a knife, and try not to laugh when it happens.) It leaves you with the sense that the writers wrote themselves into a corner with all those plot twists, and what you’re seeing is the best solution they could come up with. Or they shot multiple alternate endings, and this is the one the studio liked or tested best with focus test audiences. Whatever the reason it came about, it’s a crash-and-burn ending that leaves you wishing for something far better. Starring Liam Neeson, Julianne Moore, Scoot McNairy, Michelle Dockery, Nate Parker, Jason Butler Harner, and Anson Mount. Directed by Jaume Collet-Serra. Rated PG-13 for intense sequences of action and violence, some language, sensuality and drug references.